Watch for the premiere of the "Radio Nowhere" video [that's a still from it, above] just after Labor Day at Amazon.com. Amazon spokeswoman Tammy Hovey tells Backstreets that the video features the E Street Band as well as scenes of New York City, and that it "really matches the tempo of the song, I think fans will be really excited about it." The video will be viewable for 24 hours, on Tuesday September 4, at www.amazon.com/music. 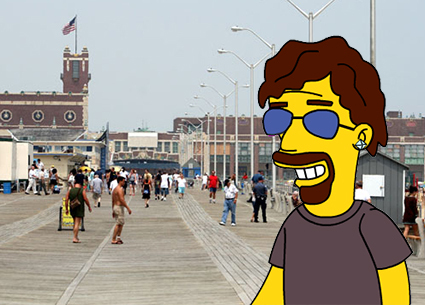 In 2002, to celebrate the release of The Rising, NBC's Today show pulled up their tent stakes and traveled to Asbury Park. This time, Bruce and the E Street Band make the trip. Their Rockefeller Plaza performance on the morning of September 28, the Friday before the album's release, will be broadcast live on Today. According to today's press release, "In their live concert on the Plaza, Springsteen and the E Street Band will perform songs from their October 2 Columbia Records release Magic as well as classic hits." More details as we have them. Why aren't Bruce and the band playing here? Get in line, pal. :-) They're not playing here either. Or anywhere in the South, for that matter. We've also heard from frustrated fans in the Pacific Northwest, San Diego, Arizona, Australia, India... the list goes on. But don't despair yet! If history serves as any guide, Springsteen and the E Street Band won't be calling a halt to the new tour after two-and-a-half months. We fully expect to see this machine motoring well into 2008, hitting more cities (and countries) as they go. Which isn't to say we don't recommend traveling, if you're able, to make sure you see a show. Just be glad you don't live in South Africa, like one frustrated fan I got an email from. But there's room in the schedule -- why don't they stop off here? Or play more shows as they go? While we doubt any additional cities will be added in 2007, there does seem to be room for second nights in some cities already on the schedule. No guarantees, but be sure to stay alert for second shows added once tickets go on sale. Otherwise, don't forget, they presumably had to do some creative scheduling to make sure a certain late night tellyvision star could come on the road. See our Tour/Ticket Info page for all the pertinent details we know for each show; following the links there will take you to the official venue site and/or official ticket seller for more information. If you don't see a link in the On Sale column, it's still too early -- or we're about to add one. I didn't score tickets today, and I'm very frustrated! We know the feeling. But hang in there, there's quite a bit of time between now and the shows, and just because you were shut out on the day of the sale doesn't mean you can't get in. There are bound to be extras floating around (aside from what the scalpers/brokers got their mitts on). Check our Backstreets Ticket Exchange (BTX), which we set up specifically to help our readers connect with each other and get extra tickets into the hands of fans at face value. Keep checking with the official ticket seller, as additional tickets are often released as the day/hour of the show approaches. And if all else fails, you can often procure a ticket outside the venue on the night of the show without paying scalpers' prices. There are always tough tickets, particularly in hot markets. But if you're willing to put in the time, there's no reason to consider yourself shut out just yet. Can you get me tickets? Nope, sorry. We're too busy trying to score our own. But we set up BTX to help. Not only is it a venue for the exchange of tickets (in the Holders, Needers, and Traders forums), it's also a great venue for the exchange of information (in the Promised Land forum). Fans on BTX are already talking ticket tips, policies, prices, predictions, venue information... there's a good chance you'll find helpful info and an answer to your query there. What's the deal with General Admission this time? Based on ticket sales and seating charts so far (and the success of this setup on recent tours), it's looking like the whole floor will be G.A., with reserved seating on the lower and upper levels. We presume the G.A. floor will include a separate Pit up front once again, but details and entry policy are unknown at this time. If anything is announced, we'll have the news here; otherwise, look for reports from the field after the first show. If you have a question that's not addressed here, before emailing us we ask that you try our general FAQ, or peruse BTX (particularly the Promised Land forum) to see if your question has already been answered. Thanks! In an exclusive Backstreets interview, Springsteen talks about the tour and says Magic was "built for it." The release of Bruce Springsteen's Magic isn't the only thing to look forward to on October 2 -- there's magic in the night, too, as an extensive E Street Band tour kicks off that evening in Hartford, CT.
Springsteen and the E Street Band played a brief series of dates in 2004, but their last full-scale outing was the tour for The Rising in 2002 and 2003. Since that time, Bruce has continued to tour extensively: as a solo artist in 2005, and with the Sessions Band last year, playing, as he put it at the time, everything that leads to rock music, but not rock music. Reminded of that now, Springsteen says emphatically, "Yeah -- I'll be playing the rock music this time. " He laughs, adding, "In case anybody's wondering." Speaking with Backstreets by phone as tour preparation gets underway, Springsteen makes it clear that he tapped his rock side for Magic, an album meant to be played live: "It's just built for it," he says. "I wrote with a lot of melody, and with a lot of hooks, and there's a lot of band power behind the stuff that I wrote this time out. So I'm excited to hear that come straight off the band." 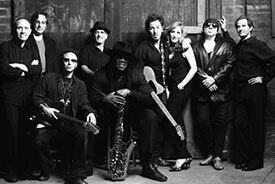 The 2007 E Street Band line-up will be the same as in 2002-2003 -- including violinist Soozie Tyrell, a veteran of the Rising tour and of last year's Sessions Band. Though not mentioned in today's press release, Springsteen confirms, "Soozie will be with us." He still raves about the Sessions Band -- "a tremendous discovery, and just such an amazing group of musicians" -- and says he looks forward to working with them again. But when he refers to "the band," it goes without saying that he means E Street. "The band is the band, you know?" Springsteen says. "It's the only place where I really do the thing that I suppose that I'm most known for, which is... it's a peak experience." For Springsteen, transition between styles is second nature. He's been doing it to a large degree since 1982's Nebraska, his stark solo record between the big E Street blasts of The River and Born in the U.S.A. As his sonic repertoire expands, his commitment to performance -- whatever the sound may be -- remains constant. "For it to be really great, you've got to be 100 percent committed at that moment. So when you're in it, that's all there is," he explains. "I think that's what it takes to be really good. So I'll just lose myself in whatever form I'm working in at any given moment. And the other things seem distant: 'Oh yeah, I like to do that too, and I like to do that too...' But really, I'm very comfortable moving between all the different formats that I play in now." In fact, it's much like -- and as easy as -- shifting gears. It's no surprise to hear Springsteen employ a car metaphor, with the E Street band as the hotrod, as he looks toward reconvening the band for tour rehearsals. "First of all, we start playing just to feel the machine again," he says, describing what happens after they initially plug in. "You've gotta drive it a little bit before you push the envelope on it." While Springsteen recorded Magic with the E Street Band, the studio process had them laying down tracks individually; September rehearsals will bring them back together to work up the new material as a unit. "We may run through a few things we know, just to reacquaint ourselves with the sound and the power of the band. How it moves underneath you, and everything. That's sort of the first thing I do, I refit myself into that bucket seat. 'Oh yeah, okay, now I remember...' And that takes all of about 15 minutes." After that? Well, it's early enough that he's not ready to say. "I don't really go in with any rigid ideas. I'm interested in seeing where the music is going to take us and where the band feels best.... I think the initial thing you try to do is to find a place for a lot of your new work. I'm excited about that. We played a lot of The Rising on the [2002-2003] tour because, once again, it was stuff that just played really well live. We've got that again in spades on this record. "And then you've got to see what people respond to. I have a good idea, but it's still a conversation with your audience. And when they start listening, and talking back, then different things come to the front." How about "The Price You Pay," from The River, which hasn't made a setlist since 1981? "It's become a thing just because I haven't played it," Bruce laughs. "If I had played it, nobody would give much of a damn if they heard it or not! Just because it hasn't been played.... You know, my recollection is that it's been a while since we've played 'Crush on You.' And I'm not sure that one's going to be popping up in the set any time soon, either, you know?" But it could, and that's one of the things that has had fans itching for the E Street Band to hit the road again -- the idea that anything can happen. "We leave the door very open, because over the course of a long tour, we end up playing so many songs.... obviously, we try to make the shows unique. I've got a lot of songs that I'm carrying around at this point, and it's fun to get to them as the tour goes along." When Springsteen got the band back together in 1999, part of the joy of the reunion was the very fact that everyone was able to reunite. Sure, available, and arguably playing better than ever, but at a very basic level, alive. Many bands haven't been so lucky, a quarter-century down the road. Another eight years along, gearing up for the Magic tour, it's still the case. "That's something that you become more grateful for as time passes," Bruce says. "You know, I just lost Terry [Magovern], my great friend of 23 years. That was a big loss. And so you're aware that things are finite. The band really did take care of one another over the years, and like I've always said, it's one of the things I'm proudest of. And I continue to be. I mean, there are a lot of ways that life can take you, and you never know what tomorrow brings. So to have that kind of stability -- and not only that, but also that the personal relationships remain so thoroughly enjoyable -- it's a great gift." All things being finite, does it enter his mind that this could be the last time out? A "farewell tour"? "Oh, I'll never do that, man -- you're only gonna know that when you don't see me no more." Of course, no doubt -- but for the E Street Band as we know it? Visit our Tour/Ticket Info page for the full itinerary, venue information, onsale dates, and links as soon as they're available. 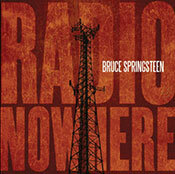 "RADIO NOWHERE" OFFICIALLY AVAILABLE TODAY -- FOR FREE! Head to the iTunes store now to get your free download of "Radio Nowhere." The song has been floating around out there for a little while, in the series of tubes that is the Internet... but there's an evident improvement in brightness and clarity on this official release (not to mention a full fade-out). If you're oustide the U.S. or just don't have access to the iTunes store, the track is also officially available at radionowheredownload.com. The price (or lack thereof) only lasts for a week, grab it now! Update: All downloads are not created equal. The mp3 from radionowheredownload.com is encoded at a higher bitrate (192 instead of 128) and lacks the iTunes version's DRM restrictions and three seconds of leading silence. Big ups to Robert Moorehead for the tip. Two shows in Germany have essentially gone on sale today, with little or no warning: December 2 in Mannheim, and December 13 in Cologne. Head to getgo.de or eventim.de for details. If you're the old-school, analog type... if you like holding an album cover that's actually an album cover... you're in luck: Magic will definitely be released on LP, and in style. We're talking 180 gram vinyl, nice and heavy, a single album in a gatefold sleeve. One more notable thing about this release: there's a good chance you can have it in your hands before the CD. 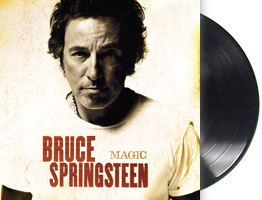 As Billboard reports, Magic is "expected to be released on vinyl a week before its CD version... The vinyl is due Sept. 25 via Columbia." We've been unable to confirm that news just yet, as October 2 remains the label's official release date, but we like the sound of it -- and in either case, we'll have the album in stock at Backstreet Records as soon as it's available. We're taking pre-orders now for the Magic vinyl LP; as soon as it drops, we'll send the album out to our customers immediately. This will be hard to find -- count on Backstreet Records to make sure you get yours. Pre-order Magic on vinyl now! By now, many people have heard the driving lead track from Magic that will officially bow on radio next week. In fact, New York's 95.5 WPLJ shot out of the gate early this morning, with co-hosts Scott Shannon and Todd Pettengill giving commuters a surprise double-shot of "Radio Nowhere." WPLJ's Programming VP Tom Cuddy tells Backstreets, "The response by listeners was overwhelming. Our request lines lit up like a Christmas tree! Fans loved it... it's three minutes and 16 seconds of straight-ahead rock 'n' roll with a terrific Clarence solo!" Plus a thousand guitars, and pounding drums.... Not everyone loved the premiere, as Cuddy continues: "We received a call from Sony Music this morning after we played it the first time, requesting that we stop. However, we told him we promised fans we'd play it one more time -- which we did." The official radio add is set for this coming Tuesday, though at least one more deejay is itching to jump the gun: Little Steven. (And really, who's gonna mess with Silvio?) Word has out that Steve will be spinning "Radio Nowhere" on this weekend's edition of Little Steven's Underground Garage. If you haven't gotten to hear it yet, tune in to Steve's show for a listen. And if you have comments on the song, just leave us a voicemail at 555-867-5309. Just in case you're on pins and needles: there won't be a tour announcement this week. Which means you won't need to be doing the Ticketmaster Shuffle this weekend (despite previous indications of an 8/25 onsale). Now, next week... that might be a different story. More here as we know it, but for now you can breathe easy. And check out Sony's Music Box to download a "Looking for Elvis" ringtone. Pre-order now from Backstreet Records: We're taking pre-orders now for Patti's new album in our online shop, on sale for 10% off the retail price. Plus: for the first 50 customers to order Play It as It Lays, we'll be including a free promotional lyric booklet for the album, featuring photography by Bruce Springsteen. See the shop for details! This morning, there's a date listed for Springsteen and the E Street Band on Ticketmaster.com: November 2 in St.Paul, MN. I rubbed my eyes, and it was still there. Ah, but for how long, for how long? Will it be joined there by more dates, or yanked until a more official announcement? In any case, it gives us something to chew on: a date that doesn't match rumored itineraries, prices at the $55/$85 level, a seating chart with an entire General Admission floor, and an onsale date of August 25 -- that's a week from today. Check it out while it's still there... and of course we'll be keeping track of which way this thing goes. Evening update: Yep, the info was pulled later in the day-- no Springsteen dates currently listed on Ticketmaster. Reliable sources assure us that the St. Paul date is legitimate. But it's still a waiting game for official confirmation and full schedule, when we'll see how many of the above details hold. Yesterday, RollingStone.com had Andy Greene talking Magic with Jon Landau (see below); today, it's Brendan O'Brien. Greene got a nice peek up the producer's sleeve, as O'Brien describes the making of the album: from a solo Springsteen running through a batch of new songs for him at home in Jersey, to the E Street Band's recording process in Atlanta (where Bruce was appointed "senior vice president in charge of Clarence’s saxophone"). We also get the producer's take on a few tracks: "Radio Nowhere" ("a pretty straightforward rocker"), "Long Walk Home" ("mournful, but also hopeful... It hits me in a real great spot"), and "Livin' in the Future" ("a throwback to 'Hungry Heart,' an R&B thing"). Read Producer Brendan O'Brien Reveals All. 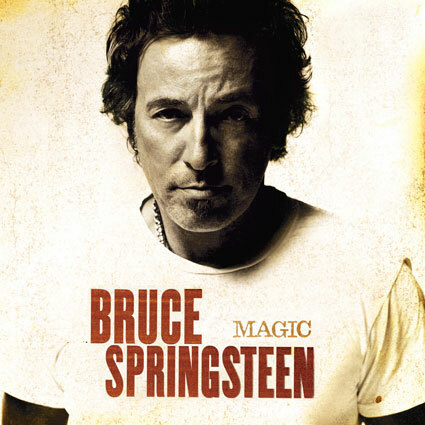 Also on the swings and roundabouts today: Bruce "conjures up some Magic" (Star-Ledger) and "makes Magic happen" (EOnline)... he's got a "Magic act," (Lifetime), he and the band "weave Magic" (Harp), and of course the "Band is up to its old tricks" (USA Today). Now that the Magical Mystery has been revealed... time to cast an eye outward to press reports, and one of our favorite post-announcement activities: a visit to the headline writers' playground. Reports today tell us that Springsteen and the E Street Band "make Magic," they "find Magic," they "spread a little Magic," they "reunite for a bit of Magic," they make "musical Magic." Fine, fine... but there's plenty of untapped potential here. No one's used "Magic Man"? Or, "Springsteen pulls new album out of his hat," or "takes a Magic carpet ride?" Okay, it's early yet. But feel free to use these, no charge. Don't even get us started on the tour, which will surely be spellbinding. "Magic in the night"? Dibs! As for substance: see stories today from Larry McShane for the Associated Press, and Andy Greene for Rolling Stone. 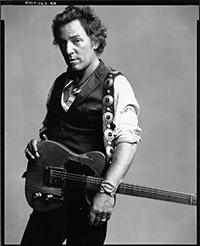 McShane describes the title track as "atmospheric," in contrast to the rest of the album, "billed as Springsteen's return to rock 'n' roll." He also confirms that the album was recorded with the full Rising-era E Street Band, including Soozie Tyrell: "Last year, Springsteen said he'd already written a 'whole book of songs for the E Street Band.' He assembled the band earlier this year and they finished the album in two months, about the same amount of time spent recording the multiplatinum The Rising." Read McShane's AP story here. Greene spoke with manager Jon Landau, who says, "[Bruce and I] have been together since 1974 and I don't think I've ever seen him more excited than he is right now about this record... Clarence [Clemons] has some great moments on it. You could say that it's a little more sonically guitar-driven than any past Bruce album. There are a few sort of pop, romantic touches that haven't shown up recently, but were very prominent on the very early records." Landau goes on to talk specifically about "Radio Nowhere" (the album's first single), "Long Walk Home," "Girls in Their Summer Clothes," and "Devil's Arcade." He remains mum on the subject of a tour, but he does bring up American Idol.... Read Green's full article here. According to manager Jon Landau, quoted in today's press release from Shore Fire Media, this one's a rocker: "Magic is a high energy rock CD. It's light on its feet, incredibly well played by Bruce and the members of the E Street Band, and, as always, has plenty to say. It's also immensely entertaining. Magic is the third collaboration between Bruce and Brendan O'Brien and is a culmination of their very productive creative relationship." O'Brien produced and mixed the album at his home base in Atlanta, Southern Tracks Recording Studio. Ready for 11 new Springsteen song titles? Of these, only "Long Walk Home" has been heard before; Springsteen debuted the song with the Sessions Band and played it live exactly once, in London on November 11, 2006 (reportedly the day after he wrote it). Today's press release makes no mention of a tour, but we do expect a full-scale E Street Band tour to coincide with the album's release. Watch this space in the coming weeks -- and/or sign up for our mailing list below -- for details as soon as a tour is announced. NEW AND IMPROVED -- NOW WITH MORE BRUCE! There's a brand new cut of the Danny Clinch-directed video for "Broken Radio," with the focus exclusively on Springsteen and Jesse at the mic. Check it out on YouTube. It is with great sadness that we report that longtime Springsteen associate and close friend Terry Magovern, 67, passed away in his sleep on Monday night. For the last 20 years, Magovern could be seen regularly at Springsteen's side. An imposing figure, seemingly the walking embodiment of "You better be good for goodness sake" wherever he accompanied Springsteen, Magovern had a kind and gracious nature, one pleasantly at odds with his professional image. Magovern began working for Springsteen in 1987, but the two had already known each other for decades by that point. They met at the Upstage in Asbury Park in the late '60s; "Right from the first time I heard [Bruce] play," Magovern told journalist Robert Santelli, "I believed in him and his music." In 1971, as manager of the Captain's Garter in Neptune, Magovern hired the Bruce Springsteen Band to play. In the years that followed, Magovern managed a number of Shore clubs, including Clarence Clemons' Big Man's West in Red Bank. By the time he went on the road with Springsteen for the Tunnel of Love Express Tour in 1988, he had a wealth of experience in the music business. 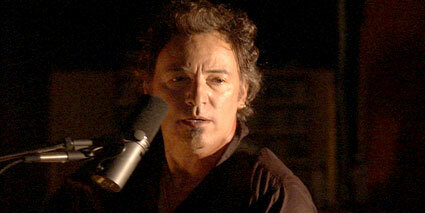 He has been an intergral part of Springsteen's work life ever since. It would be hard to overestimate the impact Magovern's loss will have on those with whom he worked, just as it's hard to pin down what his job actually was. Magovern was "Road Manager" on the Tom Joad tour, "Personal Assistant" on the Rising tour... but just as often his official role was no more (and no less) than being himself, as in the multiple tourbooks that list the credit, "Terry Magovern: Terry Magovern." Personal aide, liaison, researcher, reconnaissance man, right-hand man, right arm... Magovern played a larger role than we can probably know in helping Springsteen navigate the demands of his profession and get his music to the masses. And he touched many other lives along the way. Our hearts go out to all those who knew and loved him. Magovern's death follows that of his fiance, Joan Dancy, from ALS in 2005; after Dancy passed away, Magovern established an organization in her honor to help others who suffer from ALS. Donations, in lieu of flowers, will help that group's continuing work: The Joan Dancy & PALS Support Group, Riverview Medical Center, 1 Riverview Plaza, Red Bank, NJ 07701. Watch for a tribute in Backstreets #87. All right Toronto!! Lots of fun to be had in the Onion A.V. Club's 15 Masters of Onstage Banter. On Broadway: The Jersey Boy meets the Jersey Boys. Spinner.com has Neal Preston talking about two classic Bruce shots, here and here.